"If anyone teaches false doctrines and does not agree to the sound instruction of our Lord Jesus Christ and to godly teaching, he is conceited and understands nothing. He has an unhealthy interest in controversies and quarrels about words that result in envy, strife, malicious talk, evil suspicions and constant friction between men of corrupt mind, who have been robbed of the truth and who think that godliness is a means to financial gain. 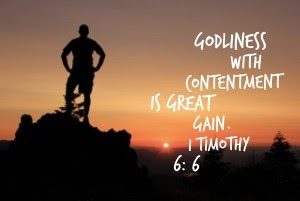 But godliness with contentment is great gain." As you work, you earn an income. Work could be through gainful employment or a profitable business. In such cases, the income is called "active income". There is passive income as well, but for the purpose of this article, we will only discuss active income. After you give properly and generously, including taxes, tithing and offering, what remains is discretionary income--income that is at your disposal. After saving part of your discretionary income to prepare for predictable and unexpected events, the remaining amount is disposable income that can now be spent freely. If you manage to spend within this disposable income, you create a margin to earn less, give more, save more, or even spend more. Spending is determined only after the sizes of giving and saving are determined within the boundary of earning. Although many see this theory as idealistic, there is biblical truth to be revealed. The reality is, many believe one should spend what they earn, especially in hopes to earn more with this spending. However, we should keep in mind ways to give and save, as opportunities can be afforded. Some who are "religious" may make an "investment" in God in hopes of earning more faster. They may spend more, live a more materially fulfilled life through this spending, save more and give more in hopes of earning more faster. Sounds familiar? At least looks familiar? In reality, this idea is rampant. So rampant that it has become an epidemic. It is a social and cultural disease that is highly contagious. It is called Affluenza, a viral disease of the soul that causes people to pursue affluence with strong desire. This disease is not a recent phenomenon. It was also a dangerous threat in the early churches. In the passage quoted above, Apostle Paul's first letter to his disciple, Timothy, warns against those religious Christians who often teach false doctrines and use their seeming godliness as a means for financial gain. He is also encouraging Christians to live a life of contentment and godliness, which will then be a tangible and eternal great gain. Contentment pertains to a frugal life of spending within our means without compromising on giving or saving. Godliness includes godly earning without seeking to earn excessively at the cost of faith, family, friends or health. Missional business entrepreneurs should intentionally seek and, in essence, practice both godliness and contentment, with equal importance. SfK Life is considering the Investment Policy and also making the first couple of investments. The development of a cloud-based database using Salesforce.com continues, slowly but surely. Ji Bae, Director of IT is working with three volunteers on this project. SfK Life will launch its first fundraising campaign towards the year-end. SfK Korea - We plan to complete the establishment of SfK Korea by September and the first BAM Fund within 2016. Please pray that SfK Korea will form the founding board with godly men and/or women who will provide biblical guidance to lay a strong foundation. SfK Rwanda - We focus on strengthening the pool of Kingdom Fellows so that African Kingdom Fellows may be able to support missional businesses adequately. Meanwhile, one Kingdom Fellow will focus on identifying prospective missional businesses in Rwanda. SfK Tanzania - We are in contact with one missional business in Arusha. We plan to make a visit in October for the initial assessment. SfK Thailand held a one-day seminar for 25 (prospective) missional business entrepreneurs including five missionaries. Three expressed interest in joining the business incubation center in Bangkok. SfK Thailand plans to hold a Start-up Business Plan Contest in November. Three winners will receive cash prizes and advisory support plus other incentives. 1. Neo Moravian BAM School in Seoul, Korea in July/August - This 4-week intensive training for missional business entrepreneurs continues. Jeffrey will serve as a member of the panel to evaluate their final business plans to be submitted and to encourage them for the final two days on August 18 and 19. 2. SfK Life Corporation (USA) board meeting in August - The board will hold a regular board meeting on August 12th and consider several issues of high importance. Please pray for the board members to depend on godly wisdom. 3. Korean BAM Global Gathering in Sorak, Korea in September 5-9th - This event has been renamed from BAM Consultation. Jeffrey will serve as a speaker and an advisor for this 5-day event. If you are interested in participating in this event, please send an e-mail to Jeffrey at jlee80111@gmail.com. The Lord may provide for us funding that will be sufficient to address the needs that we identify for His Kingdom.